It won’t be any of the above, for as we know the party leadership is holding the special conference in the hope of effectively removing the collective voice of trade unions from the party. These affiliates will then — in theory at least — magically transform into hundreds of thousands of individual trade union members of the party. The special conference came about because Labour leader Ed Miliband panicked under ferocious Tory fire following the Falkirk debacle and conceded what the Tories have been trying to do ever since the 1926 general strike. Sadly, instead of listening to level-headed trade union leaders and the party as a whole, Miliband listened to those who had brazenly cooked up claims that Unite was signing up members to the Labour Party without their knowledge in Falkirk. A deeply flawed internal party report was sent to the Scottish police who abruptly said that there was no case to answer. Now, finally, the Labour Party nationally has been obliged to admit that the Unite-backed candidate Karie Murphy and the chair of the Falkirk party Stevie Deans have nothing to answer for and will be reinstated immediately. Yet that report, which provided the catalyst for Miliband to demand the trade union influence in the party be massively diminished, will still not be published. It should be as a matter of urgency. State funding of parties is incredibly unpopular and for good reason. Seeing the mess Labour has got itself into with the union link, doubtless Lynton Crosby and the Tories will even now be preparing to campaign heavily against it. If the Tories win the general election, or enter into another coalition, there will be no state funding and if these proposed changes are agreed at the special conference, Labour will soon be bankrupt. This is the politics of a kamikaze pilot. There is simply no other way to describe it. I understand why the GMB has decided to slash its affiliation to Labour. 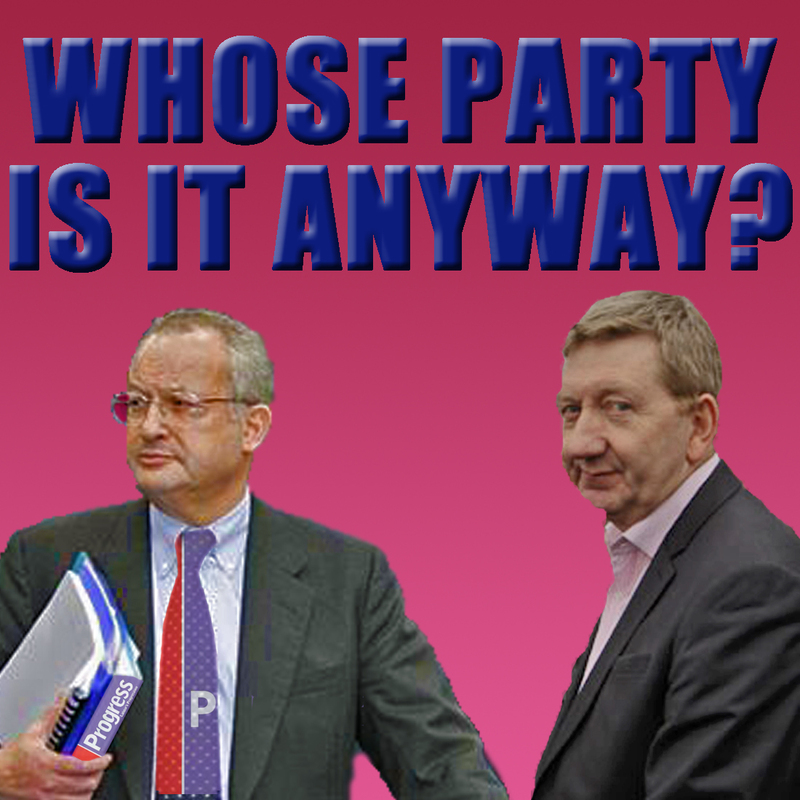 What better wake-up call can Paul Kenny and his union send to the Labour leadership? I can also understand those in the union movement who rightly feel that the Blair years in power let them down badly and that they are simply tired of being treated as embarrassing elderly relatives. The temptation to target liberated political funds into other causes or even a new political party is a powerful one. But British politics is littered with the corpses of breakaway parties, from the SDP to Respect. The Labour Party is not the property of its leader. It is by its own constitution a federal democracy. It is the party that the trade unions created and it is the party that still has the ability to deliver for ordinary working people. Now is not the time to walk away or reduce the unions voting strength. Nor is it time to abandon collectivism just because a new generation has yet to appreciate that individualism was Thatcher’s discredited creed. By all means let us see if we can get more trade unionists to join the party. But let’s not pretend this can in anyway compensate for any loss of the collective union voice. Across the country Labour and trade union branches and ordinary members have been signing up in droves to a new campaign, Defend the Link. There is still time for good sense to prevail and for next spring’s planned special conference to flesh out policies that matter to ordinary people and which could carry Miliband and Labour into power. Is Ed Miliband facing his High Noon at the TUC? If Miliband’s reforms succeed it’ll be the end of the Labour Party – unattached from ordinary people, the L.P. will drift off into a New Labour dream world. And if Miliband fails it’ll be the end of him as leader. Sometimes principles have to come before taking the money. And EdM is right to insist that TU members have the right to opt in, and donate, or opt out is they so choose. And the TU’s really do need to question who they are actually representing by consulting their members a bit more. The great tragedy of this phoney debate is that just when we should be facing down Cameron, we are engaging in self indulgent navel gazing. This year’s priorities should be on maximising our vote in the European elections, securing a no vote in the Scottish referendum and compiling our 2015 manifesto. Instead we’ll see hundreds of people in a hall for some hours who if they were working could be delivering up to 100,000 leaflets, making 50,000 phone calls or organising 500 street stalls. This is the politics of the madhouse.